Hello crafty friends, I wish you are having a great day today! 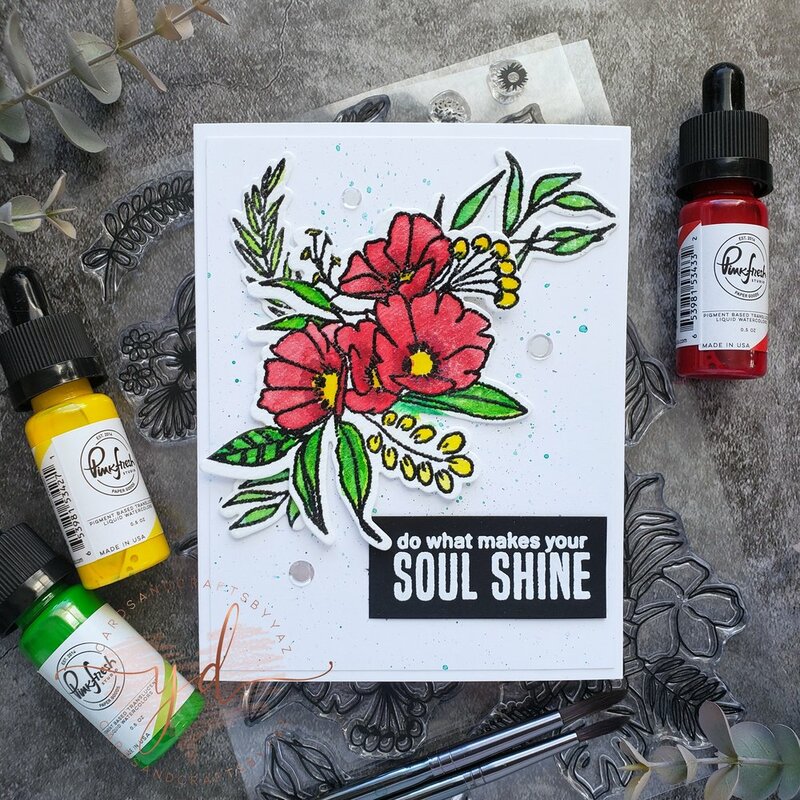 On today’s Blog, I’d love to share with you these beautiful water colored floral cards that I created featuring the new Fancy Blooms stamp set & its coordinated dies by Pinkfresh Studios. These cards were so much fun to water coloring as this was my first time using liquid pigment watercolors. So that being said, let’s get started! To begin with I started by stamping every single image from the stamp set with black ink on a sheet of Strathmore watercolor paper. In the meanwhile I gold heat embossed all the images as I wasn’t sure exactly on what images I was going to use at that point. So, for the first example. I started by scoring an A2 size white card base and I set it aside, next I grabbed a white card panel a little bit smaller than the card base, and I added a few splatters by using the Licorice pigment. Then I watercolor the floral image by using Sunshine for the buds, a combination between Key Lime and Emerald City for the leaves, last but not least Candy Apple for the flowers. Once I was done water coloring I set it aside to let it dry. In the meantime I die cut with a die cutting machine a cover for the card panel in a piece of white card stock by using the Geo Star stand alone background die and I adhered it with liquid glue to the card panel, as you can see in the picture above. To finish it off, I adhered a few jewels in the center of the flowers. Then I adhered with liquid glue the backed of the floral image to the card panel along with a sentiment that I had white heat embossed in a piece of black card stock from My Favorite Things to Say stamp set, last but not least, I adhered the backed of the card panel to the card base. For the second example, I scored another white side folding card base and I set it aside, for the card panel I also added a few splatter, but for this I used Aquamarine color, as you can see in the picture above. Next I used another of the floral images that I had stamped. For this floral image I use exactly the same colors as the previous card. 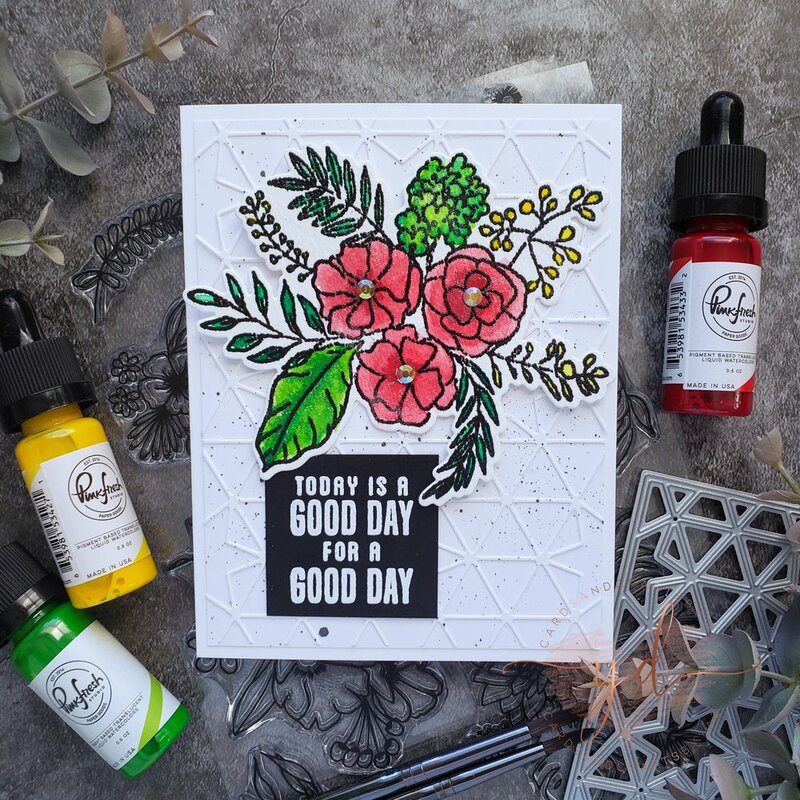 Then for the card layering, I started by adhering the backed of the floral image with liquid glue to the card panel along with the sentiment that I had white heat embossed in a piece of black card stock. ( If you see closely, you will notice that I ended up adding more leaves underneath the floral image) To finish it off I adhered a few clear confetti sequins. Then I adhered the backed of the card panel to the card base. For the third example, once again I scored a side folding white card base and I adhered a cover die cutting to it, this time I used the stand alone Folklore die. Also for this card I decide to change the colors on the flowers by using the colors Bubble Gum and Aquamarine, but keeping the same green colors for the leaves just as the previous cards. For the card layering I kept it very simple, I adhered with liquid glue the backed of the floral along with the sentiment to the card. And to finish it off I adhered a few jewels to the center of the flowers. I hope you had a great time here with me, down below is the list of all the products that I used for these card. Just keep in mind, that you can create the same designs by using any color combination, any color media, stamp sets or dies. I am no affiliated or sponsored by any company mentioned here. All products were personally purchased by me. I am creating this blog with the purpose of sharing how I design my cards. The information provided here is base in my own opinion and creativity. I am not an expert, and I only share the way that I design my cards. I am sharing the products mentioned here. Because, I Use and Love them.